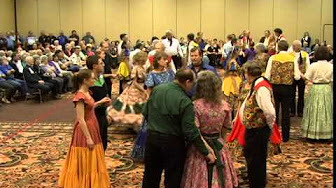 This is Part-1 of seven parts of a ninety-minute performance that was presented at the annual convention of the International Association of Square Dance Callers in 2007. That convention was held in Colorado Springs, CO. The performance featured the combined efforts of three dance groups located in Colorado. 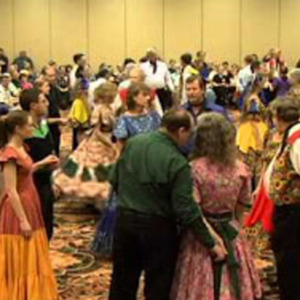 These are the Colorado Dancers, The High Country Dancers and the Rocky Mountain Dancers. Part-1 includes scenes what the Cheyenne Mountain Dancers may have danced in the 1940's as portrayed by the Rocky Mountain Dancers of Denver, CO. This dance group is under the direction of Mitch and Peggy Pingel. The next two dances are a sample of what square dancing was like in the 1950's in Colorado. It includes a typical hoedown called by Bob Riggs and a singing call named "Alabama Jubilee" called by Neal Schlein. Cal Campbell, “Colorado Square Dance History,” Square Dance History Project, accessed April 24, 2019, http://squaredancehistory.org/items/show/1755.